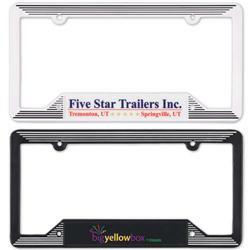 Molded plastic license plate frames in black or white with contrasting pattern and a full color imprint. 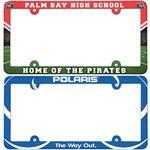 License plate frames measure 6 1/4" x 12 1/4" and include a full color, full bleed imprint. Legal in most states, we recommend checking local regulations. Made and Printed in the USA! 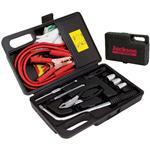 Available Colors: White or Black - Full Color Imprint on Plate. Dimensions: 6 1/4" x 12 1/4". Typical Imprint Area(s): Imprint area, 1" x 6 1/4". Two mounting holes at the top and bottom are standard. High impact plastic, decorated with one insert at the bottom. 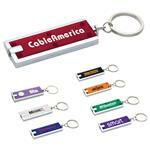 Available Imprint Options: Price includes full color imprint on bottom plate. 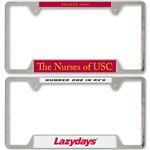 License plate frames measure 6 1/4" x 12 1/4" and include a full color imprint in bottom plate. Legal in most states, we recommend checking local regulations. Plastic. Made in USA.